As most of you know, our main financial problem is that we spend too much money on food. When I first started blogging back in 2011, we were spending over $1,000 on food each month JUST for the two of us. It's a number I still don't even understand and I feel ashamed whenever I mention it. We have been doing better over the years, but nothing to be proud of. We go to restaurants too many times each week. Too much of our food is wasted and has to be thrown away. We get lazy and tend to make the same meals over and over again. That's why one of our main goals for 2015 is to make more delicious meals at home. 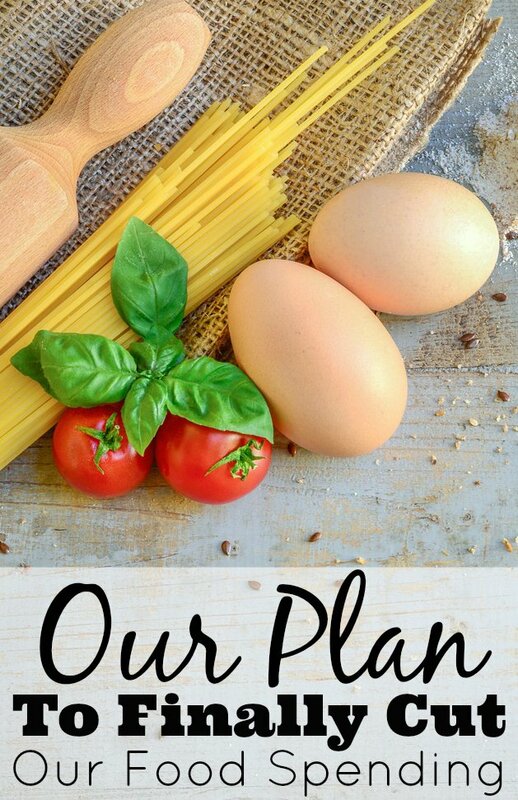 We would like our average food budget for 2 each month to be somewhere around $500 per month. We want this monthly average food budget to include going out to eat and grocery spending, and I believe this is a number we should easily be able to achieve. Happy Monday everyone! Another Weekly Update post. I hope you all enjoyed my St. Thomas and St. John pictures in my weekly update post from last week. Also, don't forget to check out my sister's blog, FITnancials, that I am helping run (she is the writer). I also have a $399 cash or tablet giveaway that will be up on my blog later today. Please come back and check that out! Then on Sunday spent about 5 hours looking for homy gym equipment, and then about 3 hours setting it all up. 1. Pay off ALL of my student loans. My goal is to completely wipe out the $38,000 of student loans that I graduated with in August. I've been calculating it (yes, I do this all the time) and they are still on track to be completely gone by March or April of this year. April will be the latest and lets just hope that nothing changes and takes me off from this schedule. Now that we plan on having everything that we need to work out in our basement, we definitely should have no problem with working out and getting more toned. Me and W plan on making a workout schedule for ourselves and are super excited to see our results. 3. Save for a decent sized down payment. We are about 75% positive that we want to buy a new house in 2014. I plan on making a new post on this soon. A lot of you have wondered why we want a new house and why we want to sell our current house. It's probably all lifestyle inflation and in my head but I still want one. 4. Plan an awesome wedding! We did spend some money in the past week, but some of it was from bonus money that W earned. He gets a bonus card from the car brand he sells, and it's all deposited on a debit card. Now, this is different from his monthly “salesman of the month” bonus that he's been earning (that is all direct deposited into our bank account). It's all extra money so we decided to spend some money on ourselves and have some fun. And we did spend a lot of other money, which you can see below in my “being healthy” section below. I did good last week, but I am expecting the next couple of weeks to be better. I'm waiting on a couple of payments and I have some things scheduled for the next couple of weeks. Lets just hope nothing falls through! I made $940 in extra income last week. No meal plan again for this week. We didn't do the greatest with eating in last week, mainly because of laziness. We do have a well stocked fridge, I just need to cook some dinners before everything goes bad! I haven't been doing the greatest with this. 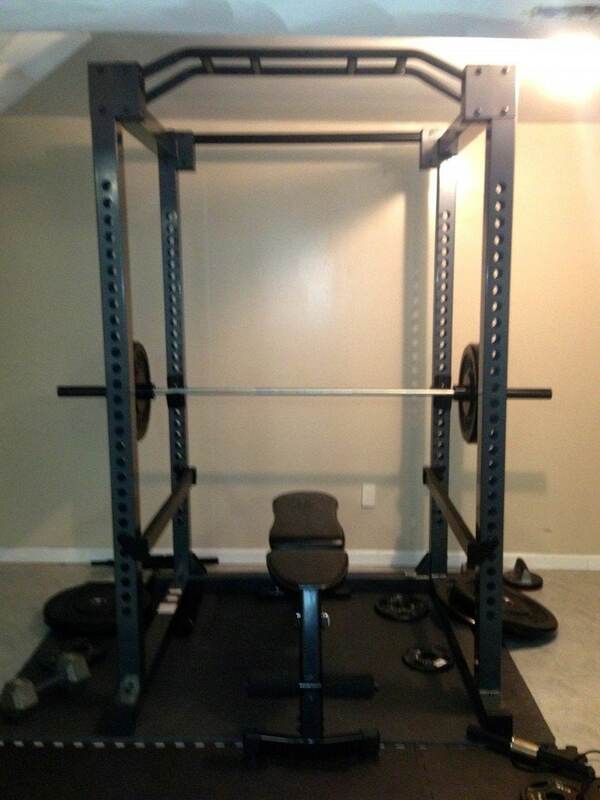 We did buy a home gym yesterday (pictured above), which was SUPER expensive. I did not realize how much everything would be just so that W could lift some weights. The olympic bar alone was $320 (tax included) and that doesn't include any of the weights which were super expensive too ($150 for the two 45 pound weights). We are still looking for a treadmill. We saw a couple yesterday but I wanted to do a little research on them. It needs to be reliable and good for 3 people to use every day. What brand/type of treadmill do you have? Let me know! Hope you are all having a great weekend! I have a picture of a dining room above because this is pretty much what I want to do with our dining room. This is actually exactly what I wanted, so when I just stumbled across this picture I was floored because what is the chance of me finding the EXACT items that I want all in one picture?! I have everything picked out and now I just need to go to Ikea badly. We plan on going sometime this month. 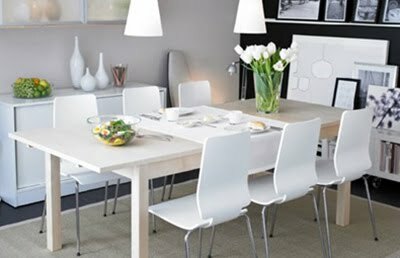 The table is more of a brown color and not white like it looks in the picture. What do you think? We are still doing GREAT with our eating at home goal. To refresh you, our goal is to eat in Monday through Friday. We went out to eat on Wednesday, but we decided that we would trade off and eat in on Sunday instead. Let me know how your food budget is going as well. What is your monthly food budget? How much do you spend on restaurants? How about alcohol? Hey everyone! I haven't posted a meal plan in what seems like forever. We have been doing FANTASTIC with our food spending this past week. We ate in 5 days. Yes, I said that FIVE. This might sound stupid to you all, but we are really bad when it comes to eating at home. I've been making a lot of new recipes (which are all super tasty) and I'm loving it. I noticed that a lot of you are on a “No Eating Out November” as I've seen on some of your blog posts. Do any of you have a goal to not eat out this month at all, or maybe even limit your eating out? I know we do! Our goal is to eat in Monday through Friday right now. Happy Monday! My weekend was good and relaxing, and i didn't get much done even though I had a lot planned that NEEDED to be done. Oh well. Halloween has definitely taken over my life this past weekend, and I'm loving it! A lot of you were wondering about my skin problems that I talked about last week. Turns out that nothing was wrong and I was given pills to make the white spots go away. The dermatologist said that it's not a big deal but it's extremely hard to get rid of the spots completely, so they will most likely keep coming back. So he gave me extra prescriptions to save me money on visiting him more than once, thankfully! The Halloween costume that I talked about on Saturday did not work out at all. I obviously have no crafty skills at all. The boy has a vacation in December. His work told him that he technically doesn't have to take it (since he won't get paid from his work), but it's also one of the slower weeks for him so he most likely won't sell much during that week. We're thinking of maybe going snowboarding and skiing in Colorado. I've never really done either so we thought it would be a nice trip. Does anyone know of any good resorts or hotels there? We would like to go to Vail, as long as it's not too extremely expensive. If we do go, then it would be the week right before Christmas. Not sure if we will drive or take a plane either, as it would cost almost the same. Spending: We did OKAY on spending this week, but not the greatest. Didn't spend too much on food and $0 on drinking, but went to the movies (during matinee though so it was only $7.50 per person) and we did surprisingly rent a TON of movies, which still adds up. Extra Monthly Income (this is on top of my salary from my job): I didn't really make a lot last week, as compared to recent weeks. I made around $250 last week. And this is exactly why I don't rely on my extra income, it is not stable! I do of course enjoy it still though. Also, I'm trying to ramp up my Swagbucks. I haven't searched using Swagbucks in forever but plan on doing so just for some extra Christmas present money. I have a shameless plug in now and it is for you to join Swagbucks using my affiliate code. I really love Swagbucks and have made over $200 in gift cards just from searching (just like searching on Google) and it's SUPER easy. PS check out Jason's giveaway! Tons of awesome prizes 🙂 1-Year Blogoversary Giveaway! Apple iPad Mini, $100 Amazon GC, $50 Paypal Cash! Food: We've been doing better definitely. Our goal is to eat in Monday through Friday of this week. I'll be thinking of a meal plan today and am going to the store after work. If you have any good recipes, please share them in the comments! Being healthy: No comment… 🙂 I'll do better TODAY.